So new you can smell the fresh paint on the reel symbols, WMS's pirate-themed Red Flag Fleet utilizes an interesting pyramid-style grid, with six reels starting from 2 spots going up to 7 spots. 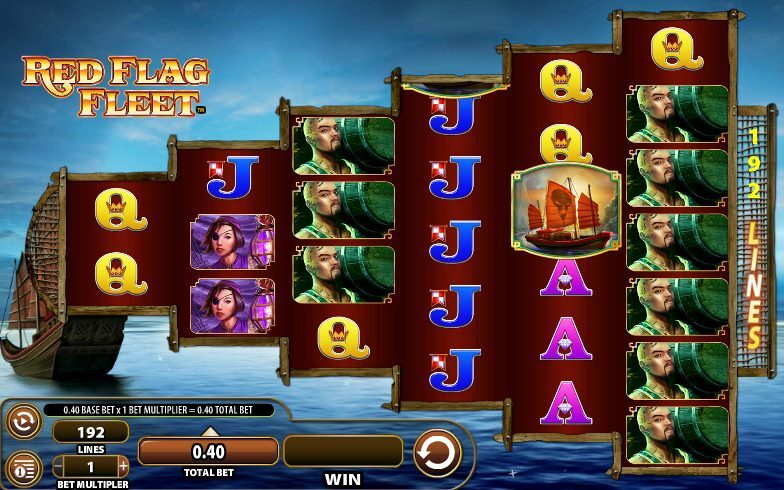 Red Flag Fleet has 192 pay-lines across its 6 reels, all fixed, and you just have to alter the betting. You start with a $0.40 base bet with a multiplier up to 200x. The symbols come stacked on the reels for bigger wins, and winning pay-lines are denoted by rope stretching across the reels. The symbols are familiar to anyone who's sat through Pirates of the Caribbean or any one of its 25 sequels: a pirate ship, a beautiful female pirate (actually, three of them), plus two mean-looking pirate guys. The game is firmly set on the China seas so everything has a nice Asian look to it and the pirate ship itself is more of a junk than anything. There are also Jack-to-Ace symbols making up the numbers. The Red Flag Fleet logo is Wild and substitutes for all regular symbols in the game other than the Scatters. 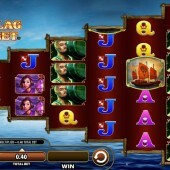 Three or more Red Flag boats on the middle five reels (2, 3, 4, 5, 6) triggers a free spins bonus. Spins escalate depending on how many Scatters you originally landed, so three Scatters awards five free spins, four Scatters awards 12 spins with a 10x multiplier and five Scatters gives you 40 free spins with a 10x multiplier. During the spins the Bonus symbol will appear on reels 1-5 and if you hit three more Scatters there you'll win five additional spins. Also, 2-3 reels will change at random to Wilds after every spin. As far as new games go, Red Flag Fleet is certainly good-looking. The reels, however, hardly moved that slowly - at least not on my PC - and the one bonus game isn't quite enough to hold the attention, even though a potential 40 free spins jackpot is pretty sweet. WMS's 192-payline system is nothing new, and if you're looking for something along similar (pay)lines check out the myth-inspired Zeus III.